All Dutch educational institutes which offer study programmes in art therapy, dance therapy, dramatherapy, and music therapy take part in the KenVaK research centre. These educational institutes include ArtEZ Institute of the Arts, Codarts Rotterdam University of the Arts, HAN University of Applied Sciences, HU University of Applied Sciences Utrecht, University of Applied Sciences Leiden, Stenden University of Applied Sciences, and Zuyd University of Applied Sciences, with the latter acting as secretary. 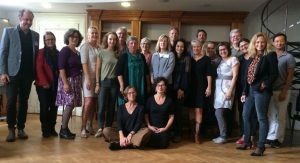 KenVaK fine-tunes its research policy with De Federatie Vaktherapeutische Beroepen (the Dutch Federation of Professional Therapeutic Occupations, FVB), and, amongst other things, participates in the FVB’s new structure in terms of knowledge innovation. 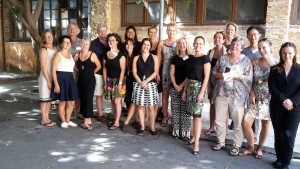 KenVaK can be regarded as a network-centric organization, and is led by Associate Professor Dr Susan van Hooren. Since September 2014, KenVaK has a special Associate Professor in the person of Professor Dr Xavier Moonen. This special research centre has been named Inclusie van mensen met een licht verstandelijke beperking (Including people with a mild intellectual disability), and is financed by Koraal Groep, an organization for people with an intellectual disability. to implement new knowledge in practice and to stimulate the professionalism of arts therapists in practice by means of in-service training and refresher courses. If you want to know more about the coöperative than watch the interview with prof dr Susan van Hooren, published in the ‘Tijdschrift voor Vaktherapie’.